There are many export opportunities for Australian producers and manufacturers, and countries within Asia in particular are experiencing growing demand for healthy, functional, free-from, organic and good-for-you foods and beverages – exactly what Australia is excellent at creating. Statistically, the markets below are experiencing growth in terms of GDP, consumer spend, and growing middle class. The best way to make the most of these opportunities is to go there yourself. And this is what Australia is excellent at creating. Statistically, both markets are experiencing significant growth in terms of GDP, consumer spend, and growing middle class. Additionally, travelling with other Australian food companies provides the opportunity to build alliances at home, share your observations, save on travel costs, and earn more interest from buyers. What are the markets and dates? We only take 6 companies per market visit, so we can provide personalised attention to each participant. 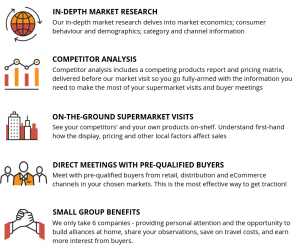 Competitor analysis, pre and post market readiness workshops, guided on-the-ground supermarket visits, direct meetings with prequalified buyers, presentations by in-market Australian representatives, and market visit led by Najib Lawand, Director, Export Connect. Excludes airfares, accommodation, meals and land transport. Register below and we’ll be in touch to confirm your place. We look forward to working with you, in-market! Click on this link to register your interest. We look forward to connecting with you, in-market!